Mouvex will demonstrate its product recovery capabilities at IFT17. IFT17 will be held from 25 – 28 June at the Sands Expo Center in Las Vegas, and brings together the industry’s largest collection of food ingredient, equipment, processing, technology and packaging suppliers. The features and benefits of Mouvex pumps will be highlighted as they relate to enhancing product recovery capabilities in food-and-beverage processing operations. 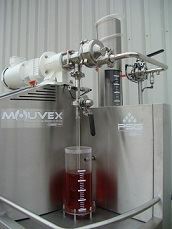 Mouvex launched its ongoing product recovery initiative in June 2014 as a way to provide manufacturers and processors with a complete suite of market-specific tools that have been designed to increase knowledge and highlight the tremendous cost-savings that can be achieved when utilizing Mouvex eccentric disc pump technology. In food-and-beverage manufacturing, product recovery refers to the high utilization (or yield) of products while substantially eliminating waste that would otherwise remain in suction or discharge process lines during changeovers or at the end of production runs.